An erudite group were assembled (pictured above) to give context and colour to our screening of James Grey’s movie The Lost City of Z. Present were David Grann - author of ‘The Lost City of Z: A Tale of Deadly Obsession in the Amazon’, Jago Cooper - Historian, Archaeologist and Curator of the Americas at The British Museum, Lizzie Carr – Explorer, Adventurer & Environmentalist and Mark Greaves - Ordnance Survey's lead consultant for Geodesy. The lively and informative discussion, led by film critic Danny Leigh, gave us the historical, social and cultural background to exploration at the dawn of the 20th century. It painted a picture of Percy Fawcett as a passionate pioneer, enduring unimaginable hardships and dangers in his obsession to bring evidence to the world of an ancient Amazonian civilization that would change perceptions of history, and indicate the hitherto unappreciated sophistication of indigenous peoples. Despite being ridiculed by the scientific establishment (who regarded indigenous populations as ‘savages’) the determined Fawcett returned time and time again to the jungle in an attempt to find proof for his theory, resulting in his mysterious disappearance along with his son, in 1925. It is an incredible, true story. The subsequent screening of The Lost City of Z however, proved to be less incredible. Gray’s film indicates that Percy Fawcett (Charlie Hunnam) began his involvement in Amazonian exploration when he was recruited by the Royal Geographical Society to act as an impartial judge in plotting a river border between uncharted realms of eastern Bolivia, and its boundary with Brazil, following a dispute about their national territories. The carrot dangled to encourage Fawcett’s agreement was the opportunity to restore his family name, previously disgraced by his alcoholic father. The interests of the empire however, rested with the continuation of peaceful exploitation of the local rubber plantations. We find Fawcett en voyage to Brazil before he encounters Henry Costin (Robert Pattinson) his aide de camp. Inexplicably, Fawcett appears to have set off on this momentous journey without meeting the principal man that he needed to rely on. It proves to be an odd interview, during which Costin appears to be drunk – a trait which he never again displays. (The film likes to throw out these random non-sequiturs). The river they are sent to plot apparently takes weeks to navigate and is fraught with dangers (an establishing overhead shot giving us a sense of the immensity of the Amazon would have been useful here) but this first expedition merely serves to give us an impression of the general environment and the reasons for Fawcett’s later obsession. We have the conventional confrontations with arrow-shooting natives, piranhas, deadly diseases and wild animals, but these are all summarily dealt with, and none of them prove to have much impact on Fawcett or Costin themselves (Costin is shown to swat one mosquito and Fawcett stands motionless to allow a snake to slither across his feet). Their unfortunate porters appear to bear the brunt of everything nasty. While in the thick of the jungle however, Fawcett does get excited when he finds fragments of pots and ruined sculptures, fuelling his lifelong determination to prove the existence of a lost city and its civilization. His second expedition is enlivened by what proves to be the less than welcome presence of the wealthy and egocentric ex-Arctic-explorer James Murray, (played by the excellent Angus Macfadyen whose performance raises the entire middle segment of the film), and Fawcett develops his contact with cannibalistic natives. Fawcett is constantly leaving behind his long-suffering wife Nina (Sienna Miller). Despite Ms Miller delivering the most impassioned speeches of the film, I could not help but feel that this particular marital relationship was being greatly idealized. The role of Nina is written as a spirited, independent and devoted woman. I doubt however, that two people who in reality had had deep feelings for each other would have accepted these years of separation. Despite protestations of ‘sacrifices’ from both husband and wife, Fawcett clearly preferred spending time in the brutal jungles of Amazonia to a life of conventional English domesticity. Likewise, although on the eve of yet another expedition Nina gives a stirring lecture to Percy on his lack of understanding of her predicament (he invariably leaves her pregnant and a single parent to their children), she frequently facilitates his excursions by finding documentary proofs of the fabled lost city. Meanwhile in Europe, the storm clouds of the Great War are gathering and we next see Fawcett in the trenches, accompanied again by his stalwart exploring companions, (Costin still sporting a thick beard – although apparently, such facial hair was not allowed, I was informed by my neighbour). At this point we are presented with the most pointless (and vaguely risible) scene of the whole film – a foreign (Russian?) female fortune-teller is inexplicably smuggled into the trenches along with some kind of Ouija board, which is never used (why would those about to die want to contact the dead anyway?). 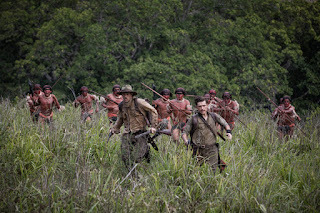 The rather redundant purpose of this scene appears to be only to remind us, amid the tumult of war, of Fawcett’s commitment to his ‘destiny’ in the Amazon. Recovering from a gas attack, we join Fawcett recuperating in a remote cottage with his family. His eldest son Jack (Tom Holland) has reconciled with Percy (after getting slapped for telling him a few home truths about being an absentee father) and has little trouble in persuading him that they should both return to the jungle and resume his quest. Gaining Nina’s consent, they set off again in a scene shot through with irony, as Fawcett makes a farewell speech to his youngest son Brian, telling him that he is now ‘the man of the family and should look after his mother and sister’ (ironic, as clearly Fawcett had never been keen to take on that responsibility himself). James Gray brings a characteristically sombre intensity to this dour adaptation of the 2005 New Yorker article and subsequent book by David Grann. It’s an odd film, taking what could have been a colourful, exciting, epic adventure in the style of David Lean and turning it into something rather austere. The Lost City of Z is instead, the cinematic antithesis of Herzog’s Fitzcarraldo. Readers of Grann's book may miss the hair-raising inventory of jungle predators ready to torment reckless human infiltrators - from deadly, invisible bacteria and strength-sapping parasites, to enormous insects, flesh-eating fish, jungle cats, giant eels and snakes. Gray has largely ignored this material, preferring to make a cold and gloomy movie which keeps the viewer detached from Fawcett’s extraordinary experiences. Despite the fascinating background details we were given by the experts in the preliminary discussion, Gray’s screenplay depicts Fawcett as, not unlikeable, but rather frosty. 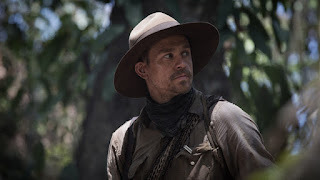 As Fawcett, Charlie Hunnam gives a robust, workmanlike performance, conveying his character's evolving strategies in overcoming English, upper-class snobbery and forwarding his own ambitions at the expense of those closest to him. However, his portrayal allows little opportunity to convey any charisma that might propel him into further roles where he is required to carry an epic movie. 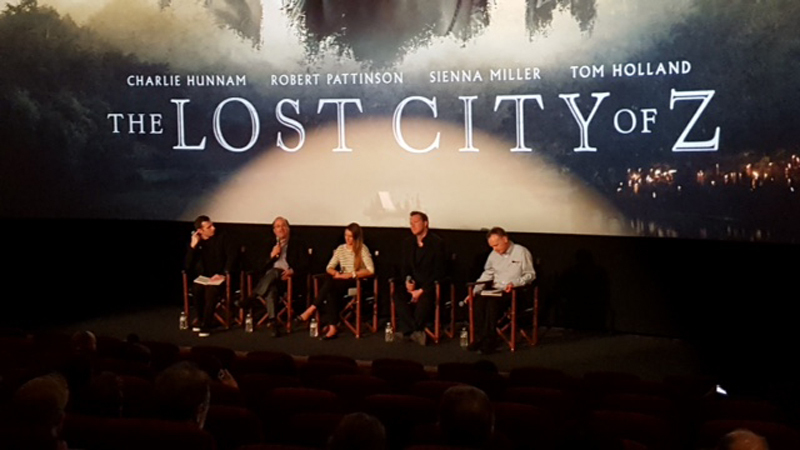 The Lost City of Z is beautifully shot on celluloid by Darius Khondji, in Northern Ireland and the Colombian jungle, but displays a muted colour palette, making the vibrant green of Ireland and jewel colours of the Amazon take on wan shades of grey. Fawcett’s missions to the Amazon appear to have been driven by a need to prove his rugged masculine fortitude and rehabilitate his family name, but after the war, and as an ex-soldier, to also escape the debasement of his own society in its uncivilized conflicts. However, the film is also muted in its presentation of Fawcett's emotional life and devoid of any sensationalism in presenting the heat and hardships of his explorations. This makes for a strangely detached, dispassionate movie about a deeply held obsession and an extraordinary journey. 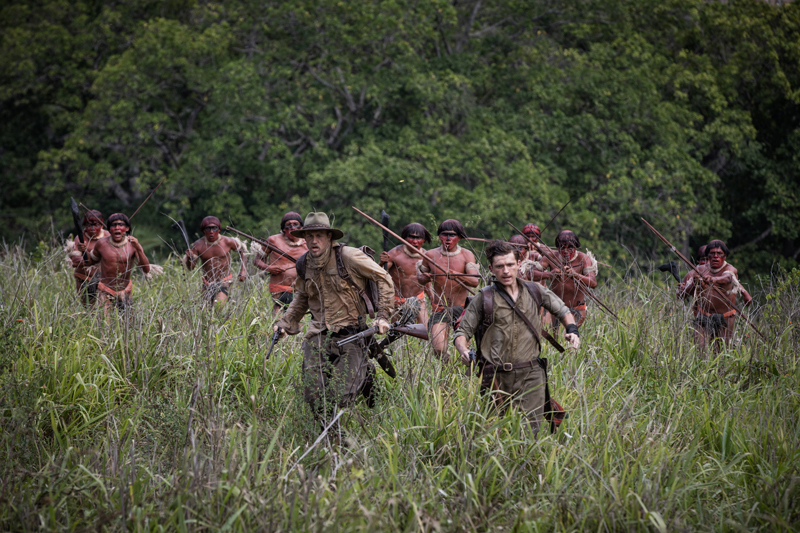 The Lost City of Z presents the portrayal of a sensational odyssey, stripped of all sensation.